When you are applying for jobs, it's important to give your resume a title that makes it clear that the resume is yours, not just that of any random candidate. It is particularly important when you send employers your resume and cover letter as attachments (either via email or through an online job application system). When the employer opens your document, he or she will see what you have named your document. You, therefore, want the title to be professional, and to state who you are clearly. Read below for more advice on what to name your resume file and other job application documents, as well as what not to name them. Also read below for advice on how to save your documents. Don't email or upload your resume with the name resume.doc, unless you want a harried human resources associate to save over your file with someone else’s. With a generic file name, there will be no way to distinguish it from all the other resumes with the same name. Choose a file name that includes your name. This way, hiring managers will know whose resume it is, and it will be easier for them to track and manage it. It’s also less likely that they’ll lose it, or get your materials confused with someone else’s. If you name your resume janedoeresume.doc, Jane Doe Resume.doc, or Jane-Doe-Resume.pdf, the employer will know whose resume it is at a glance and be able to associate it with the rest of your materials and application. If you can fit it; use both your first name and last name (or just your last name). That way your resume won't get confused with someone with the same first name. You might choose to provide a bit more detail in the title than simply your name. You can also include the title of the position in your document name for your resume and cover letter. You can use spaces or dashes between words; capitalizing words may help make the document name easier to read. Remember that hiring managers and other people who will interview you are quite likely to see your cover letter and resume file names, so make sure those titles are professional and appropriate. Now is not the time to pull out your AIM screen names from middle school. Save the joke names for your private social media accounts and keep these file names professional and simple. Consistency is important when naming your resume, cover letter, and other application documents, so use the same format for each. For example, if you simply use your last name and a description of the document for one title (“Smith Resume”), use the same format for all your other materials (“Smith Cover Letter”). Make sure any capitalization, spacing, use of dashes, and other style choices are consistent between documents. If you are applying for jobs frequently, it's possible that you have several versions of your resume saved on your computer. Avoid including version numbers (e.g., John-Smith-Resume-10.doc) in your file name and other cryptic codes. Get rid of those numbers and codes when you submit your resume. An employer might get the impression that the job is halfway down a long list of potential opportunities. A hiring manager who sees “resume-10” as part of your file name will wonder what resumes 1 through 9 looked like and whether you’re just applying for every job in town. Develop a filing system on your computer to keep track of the different versions of your resume, rather than using the file name for that purpose, and make sure that proofed, ready-to-go resumes are stored in a separate area from drafts. Before submitting your resume or cover letter, proofread the document title. It sounds silly, but a typo in the title might make an employer think that you do not focus on details and that you are unprofessional. It's important to send or upload your resume as a PDF or a Word document. This way the receiver will get a copy of your resume and cover letter in the original format. To convert your Word documents to PDFs, depending on your word processing software, you may be able to do so by clicking “File,” then “Print,” then “Save as PDF” (from the list of menu options in the bottom left-hand corner). If not, there are free programs you can use to convert a file to a PDF. 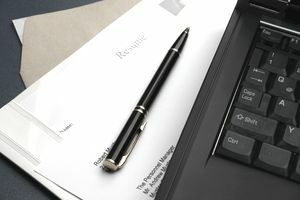 Saving your resume and cover letter as a PDF will ensure that the formatting stays the same, even if the employer uses a different word processing program or operating system. However, if the job listing requires you to submit your documents in a different format, be sure to do so. Not following instructions could cost you an interview. This is an example of a resume. Download the resume template (compatible with Google Docs and Word Online) or see below for more examples. Charismatic and creatively talented Event Manager positioned to impress your clients, associates, and project stakeholders with flawlessly executed meetings, galas, conferences, trade shows, banquets, and celebratory events. 8 years’ experience planning and handling all logistics for high-profile events including conferences, galas, weddings, ski and mountain excursions, and golf tournaments. Superb customer service and concierge talents supported by a positive attitude, charming manners, and a proactive stance in identifying and fulfilling individuals’ needs. Well-versed in coordinating and supervising cross-functional events teams of caterers, wait staff, set-up and maintenance crews, and security personnel. Bilingual in written and spoken English and Spanish, with high fluency in French. Coordinate and direct community and private events for clientele of upscale mountain resort, including ski excursions, destination weddings, and conferences. Impressed and earned referrals and repeated corporate leadership and development conference engagements from executives from Microsoft, Google, and Windermere Real Estate. Initiated social media marketing initiatives that increased client base by more than 40%. Developed mutually advantageous relationships with media representatives to publicize resort events. Organized golf outings and corporate fundraising tournaments for guests of 5-star resort and conference center. Scheduled greens times and arranged for outdoor catering and post-events including cocktail parties and raffles; handled all related marketing tasks for fundraisers. Capitalized upon opportunities to up-sell resort amenities to conference guests, driving an overall revenue increase of 15% for spa, restaurant, and pool grill. Implemented stringent billing processes that reduced delinquent accounts by 85%. Organized golf tournaments that were written up in Golf Today and NonProfit Times.